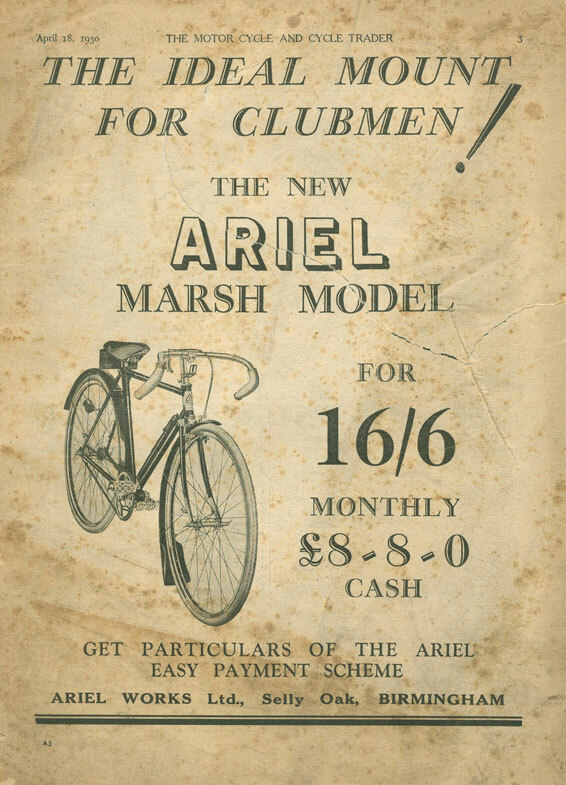 As 1930 approached Ariel began to try and adopt a more sporty appearance to their catalogue. They brought in racer Dave Marsh to develop the sports models. At first it was just detail - Marsh handlebars, caliper brakes - and paint job - red headstock and 'billiard cue' markings. 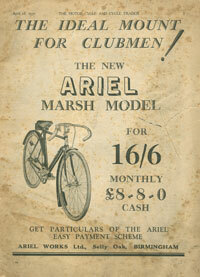 However, at the 1929 Cycle and Motor Cycle Show Ariel announced the new 'Marsh Model' for the 1930 season. The advert gave more details - "Designed by the famous Dave Marsh, the only Englishman who has ever won the World's Road Championship, and built under his personal supervision." 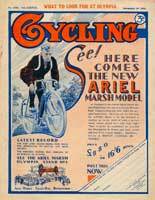 It also announced that "Dave Marsh now holds the Birmingham to Bristol and back record, breaking the previous record by 30 minutes and 38 seconds" using the new Ariel. 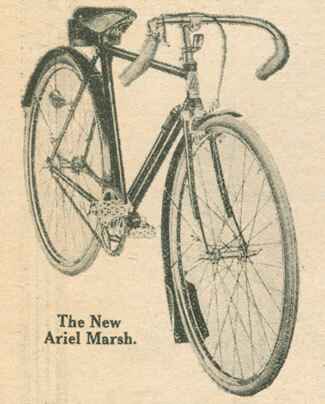 "The advent of a huge concern like Ariel Works into the specialized lightweight market is a matter of sufficient interest in itself to warrant large attendances at their stand. All the resources of a great factory have been brought into play for the production of the new Marsh model (a test of which was described in our issue of October 18th). Briefly summarized, its specification is as follows :-Frame height, 20 ins. ; butted tubes; lightened lugs; brazed-on fittings; D to round forks; lightened fork crown; Endrick chromium-plated rims; Marsh handlebars on adjustable stem; Pelissier brakes; Bluemel mudguards; grease-gun lubrication. Selling at £8 8s., it will be well worth examination, especially by the man who wants a two-purpose speed mount of absolute dependability. Similar prices have been fixed for the Grand de Luxe roadsters, and below that figure there will be 13 Ariels and 16 Fleet models, catering for every conceivable requirement." 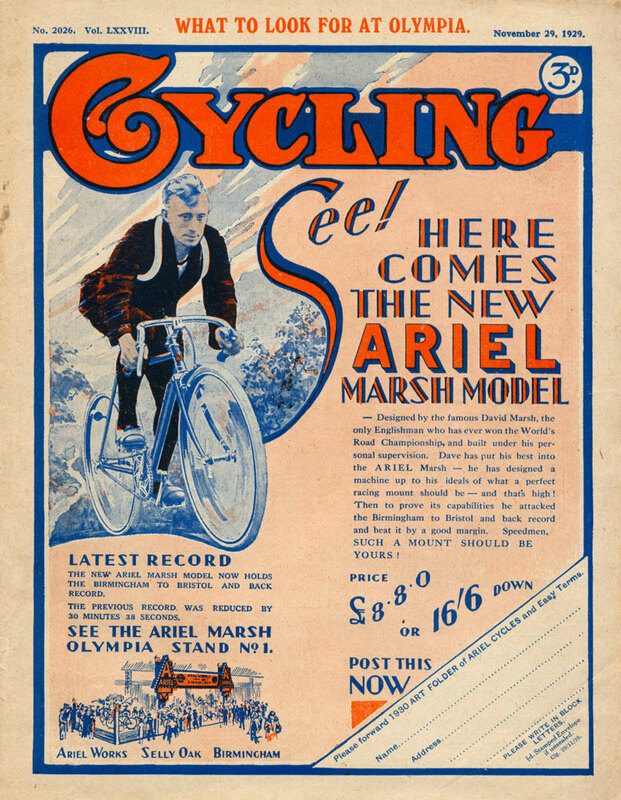 Adverts for the Marsh model were frequently placed in Journals, such as this example from the Cycle and Motorcycle Trader.